Which one is which? We all know Vlix was to be part of the 2nd series of Droids figures that were never produced in the US. But for some strange reason Vlix WAS produced in Brazil by the Glasslite company. This is a side by side comparison of an US Prototype first shot and a production Glasslite Vlix. If you look close you will notice several differences. Can you tell which is the prototype? The Vlix on the right is the US prototype. While the other is the production Glasslite piece. 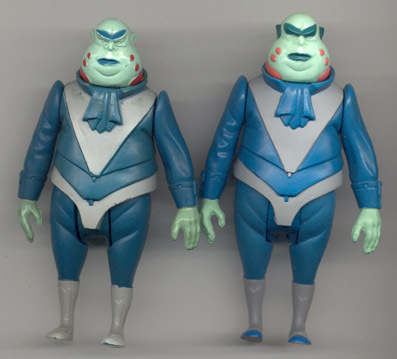 The obvious differences are: The US figure has his toes painted blue while the production figure does not. The ears are also only painted on the US figure and the eyebrows are painted on both the upper and lower sides. Minor differences are that all the colors vary slightly with the production figure being a tad bit darker all around. Also the very tip of Vlix's gray vest is painted on the US prototype only. Lastly, of course the glasslite figures has LFL. 1985 on his rear left thigh. One of the most interesting piece of Star Wars history and my favorite figure.